After the celebrations Friday night, we were back at rehearsal late Saturday morning. 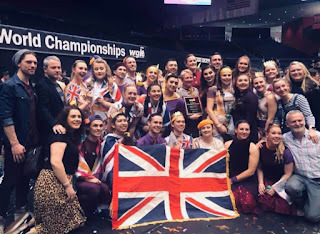 First of all, some of the staff went to UD arena to pick up the finalist wristbands and also to support our Dutch friends, Sensation, who had an outstanding run and ended with the bronze medal in the Independent Open class. We had also received an email from the BBC asking us for an interview and so were met by the CEO of WGI and taken around the back areas of the arena to a private room where we spent about 30 mins being interviewed, explaining about winter guard in the UK, Mayflower's success at WGI and some basics of the history of winter guard and Mayflower (starting out as an all-girl drum corps). The piece will be broadcast in June on BBC Worldwide (with an audience of 110million!) and will be part of an hour-long feature - so watch this space! We then headed back to the Sports Centre for rehearsal and we had a large group of supporters including the Railman winterguard (run by ex Mayflower member, Miles). Rehearsal was relaxed and we focused on a few key areas and our 'big moments'. Then some downtime at the hotel and food and we left for the arena to unload one last time. The guard got to watch a few groups before we headed into warm-ups (followed by the Flomarching camera crew). By day 3 everything is very familiar and this year (unlike 2016, when it snowed), the weather was pleasantly warm so we lined our props up in order of performance (WGI has a very slick method for doing this) and then moved from body to equipment warm-ups and then to the top of the tunnel. We have been fortunate for semis and finals to have CGT Dallas help us with our tarp, so this made getting on and off the floor much faster. The crowd was AMAZING at finals and there was a huge cheer for Mayflower as they entered the floor and were announced. The guard had their best run of the 3 days so you couldn't ask for more, and most of the members felt they had their best performance. Fortunately, we have sold our tarp and flags so straight after our performance we needed to strip the poles and try and find the bus to load the tarp onto - this was a little like finding a needle in a haystack and after being told exactly where the bus was, and not being able to find it, we heard they had already left! More frantic comms resulted in the bus coming back and us loading the tarp and getting back to watch the rest of finals. The crowd was amazing and so were the guards. The standard this year is truly amazing and seems to get stronger every year. So we were delighted to end up in the top 15 and continue to be 'part of the big party'. Tomorrow is a relaxing day of shopping and our last meal together before we start the trek home. Today is semi-finals day and we perform at 2.30pm so that meant an early start for the guard. We had booked this rehearsal space 8-11am via WGI and it was far from ideal: a soccer field with 'turf turds' (sorry, I don't know the correct term!) - little black beads all through the astroturf. WGI is very strict about leaving nothing on the arena after your performance so we had to make the call not to use the tarp in rehearsal. Not only that but there was netting on the ceiling which made it impossible to rehearse high tosses. However, in true Mayflower spirit, everyone made the best of it and we had a productive rehearsal, detailing some of the things the judges had commented on and chunking through the show. Then we changed at the facility and got ready for semifinals. Illness has been spreading through the guard this week and we had one member who was touch and go if she would march, but she was absolutely determined she wasn't good to miss the chance to perform one more time at UoD. Things are a little more familiar now so ran smoothly. We had also agreed with CGT (Michael's other guards) that we would all help each other on and off the floor, so this time we had a 30 man floor crew! Yesterday in prelims we received 0.2 in penalties for boundary violations (we weren't even aware there was a side boundary), so we were determined that would not happen today. The T&P judge even question our pictures to ensure the covers were not glass (illegal to use)! We ensured everything was within the boundary and set up and pre-show went smoothly. It was a frustrating performance, many aspects were better than the day before and all our big moments were solid but everyone knew we could have had a stronger performance so now there was the long wait for semi-finals scores, which would not come out until the conclusions of semis. Going into semis in 15th place is a scary place to be. This 16th place guard has nothing to lose and 15th wants to dearly hang on to that position - so the wait was LONG! The guard got to watch the rest of semi-finals and we saw quite a few nervy performances from other groups as well as some outstanding shows. The standard in IW class is through the roof this year - so much stronger than the last time we were here. Once Pride had concluded their performance we headed back to the buses and back to the hotel foyer to wait, as a group, for the scores. This has been a tradition for the guard to meet here and find the scores together. This time it was either going to be good or bad news! After frantically hitting 'refresh' on CompetitionSuite, the recaps came in, and the staff checked and double checked before announcing to the guard that we had, for the 5th time, made it into WGI finals in 15th place. The guard above us, UCF Pegasus dropped from 14th to 16th and Lexi moved from 16th to 14th (congrats to them). This achievement felt more emotional and happy than all our other trips because the standard is so high and some amazing and big-name groups didn't make it in. You can imagine there was a lot of cheering, loads of tears and much hugging. Happy and jubilant was an understatement, and these are the memories that we will all hold for the rest of our lives, and these are the moments that make all the blood, sweat and tears, & hours spent in a gym worth it. So a few drinks to celebrate were in order (and some decent food) so we headed to Red Lobster and had a small drink (or 2). Tomorrow we have a late start, a 3-hour rehearsal (where I am sure there will be a big crowd) and then relax at the hotel, change and get ready for our WGI World Class finals performance at 8.30pm (1.30am UK time) of "Fleur De Mai' one more time. And just that like, it's time for prelims! Since we performed 2nd to last in prelims, we had a late start which meant we all got to eat together at Cracker Barrel. 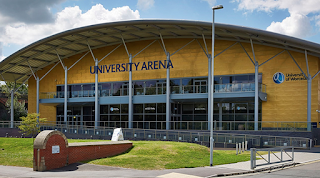 Then we headed to James Trent Arena for our short 3-hour rehearsal. This facility is a fantastic space so we made the most of the high vantage point. Rehearsal went well and everyone was relaxed. We then headed over to the arena to watch a few guards before our prelims show. It was the first time at WGI for about 50% of the guard, so it was important they got to see 'the lay of the land' before walking out on the floor. Then it was time to meet for prelims - check in - body warm ups, equipment warm ups then headed to the top of the tunnel. It was a little congested which meant we had to wait for Pride of Cinncinnati to move their props before we were able to move down, this didnt get us much time to get rid of shoes and pre show speeches. And then it was time to enter the floor. Understandable, a few members were nervous. There was a sizeable crowd, which was great for prelims. The guard had a good run for prelims and many were happy, some know they can and will have a better show tomorrow. We then packed our props and equipment away and headed for photographs. We headed back to the hotel to await the scores. We scored an 86.1 (with 0.2 in penalities) which placed us in 15th place - which in such a talented packed IW class, is a fantastic achievement. It's always hard for Mayflower (or any international group) to know where we might place, so we were happy with where we are so far, albeit it we know we can be better. So some time to eat and relax and then tomorrow we do it all again! An early start tomorrow, 8-11am rehearsal. We perform tomorrow at 2.15pm which is 7.15pm - we hope you are watching! Wednesday started early as we departed the hotel at 8am to travel to Kentucky for rehearsal for the day. It has been a challenge to find rehearsal space this year but we are fortunate that we have had many of our American friends helping us out and this resulted in finding a fantastic gym space in Kentucky but it did mean a two hour drive with lots of traffic. We arrived by 10am (later than expected due to diversions because of mud slides) and were met by Scott (thank you Scott!!!) who showed us around the gym and left us to it. The gym enabled us to get up top and so we could focus on drill and getting the members comfortable performing on the larger tarp. Everyone was in great spirits, if a little tired (jet lag definitely kicked in) and we had a great 6 hour rehearsal and the best run of the year in the final rehearsal performance. 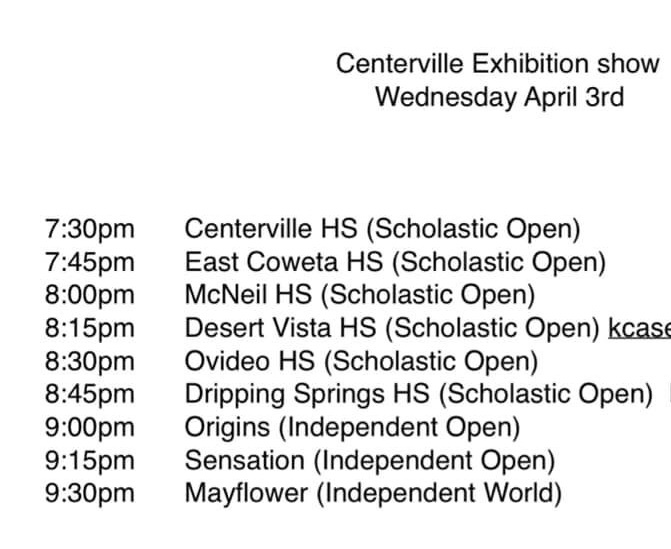 We then left and started making our way back to Dayton, with a stop for something to eat at Applebees and then continued the journey back to Centreville to perform in the exhibition show. It's always great to get our first public performance in the USA under our belts before prelims and in year's past, our performance at Centreville has never been great so we were delighted when the guard broke this curse and had by far the best performance to a very appreciative crowd ending with a standing ovation. It was also an opportunity for staff and members to reconnect with friends they haven't seen for a long time, including many Mayflower alumni members going back to 2010. After reloading the vans we headed back to the hotel for some downtime. 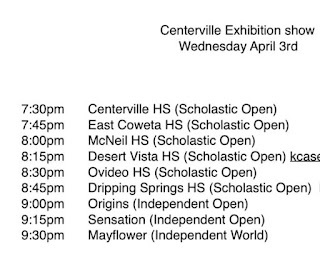 Tomorrow is prelims day and since we don't perform til 8.30pm we have a late start. So the day looks like the staff checking in at the arena and doing sound check. The guard eating brunch at Crackerbarell and a short rehearsal block from 1-4pm before changing and heading the arena to watch some guards before our prelims prep begins and our prelims performance at 8.30pm (1.30am UK time). Everyone is in great spirits and everything has run like clockwork so far. We couldn't do this without the supoort of many people both sides of the atlantic and we are very grateful for that. We are settled into our hotel and some people had a good night's sleep whilst others suffered from jet lag (so waking early). Tuesday morning meant picking up the new tarp, the pole, trolley and sound system from Centerville. We have also had some amazing people in West Ranch HS remake our 'bouquinistas' so we went to pick them up - as well as a trip to Walmart to pick up additional props we had pre-ordered. All went like clockwork and by the time we arrived at our rehearsal facility, all poles were taped and props assembled. We opened the new floor (we are using a floor in Dayton that is 15 foot deeper and 15 feet wider) and Michael Shapiro arrived to spend the day with us opening out the show. In previous years this has been a stressful day for the members and the staff but this year was very straight forward and the member's show has changed that much (besides adding a few 100 extra steps to their fitbits!). As well as opening the show out, it also gives the guard a chance to acclimatise themselves and start to get more consistent. 4-5- days of daily rehearsals really does make a difference to our consistency, which is the name of the game now (as it is for every other guard). We finished rehearsal with a strong run and a final chat with Michael before he spends the day on Weds with his other guards and then leave WGI for NYC! After loading the vans (fortunately, everything fitted in which means we don't have to construct and deconstruct the props every day) we headed back to the hotel and then our dinner reservation at Olive Garden. A fun evening was had and some good food (and cocktails) was eaten before some down time back at the hotel. Tomorrow we head to Kentucky for a 6 hour rehearsal block and then head to Centerville to do our first US public performance of Fleur De Mai. After a LONG day of travelling, we finally made it to Dayton. It has been a day of delays for all parties travelling, so that meant the main group travelling was 1.5 hours late arriving in Chicago and therefore we had to be fast-tracked through security if we were to make our connection to Dayton. It was compounded by the fact we needed to change terminals and the monorail isn’t working so we had to transfer via bus. Some of the airport staff were amazingly helpful whilst others didn’t seem to have a clue! So it was chaos!!!! Anyway, we made it to the terminal with 15 minutes to boarding (a rather small plane!) and had a smooth quick flight to Dayton! It was nice and quiet when we arrived at the airport (I suspect the quiet before the storm this week), so we picked up our 3 minibuses and van and headed to the hotel. Many of the members headed over to Walmart to stock up for supplies and then get some much-needed sleep (if jet lag allows!). Tomorrow we pick up our new tarp, our poles (thank you McCormicks! ), cart, sounds system (thanks to Centerville), props and spend the day with Michael Shapiro expanding our show to fit the bigger tarp. It's a super busy day getting all the pieces of the jigsaw in place - but with some much pre-organisation and help from our great US friends, fingers crossed it all goes well. And just like that, it's UK finals. This season has flown by in a blurr! The World guard had a short 4-hour rehearsal in a great facility on Friday before heading up to Worcester (after some terrible traffic). The finals venue is a fantastic place and is a good dry run for Dayton (it's like a mini Dayton!). Today we get the honour of performing first (UK finals prelims is in reverse order World, Open, A, Junior prelims, then Cadets finals then Junior, A, Open and World finals). So it's an early start for us as we kick off the day with our prelims show at 11am. We have been simulating the experience of Dayton/UK finals with body warm-ups transit to equipment, pre-entry etc. so prelims prep went like clockwork and the members were calm, prepared and excited to bring Fleur De Mai 2 more times in the UK. We then got to support our A guard before heading out for some lunch. Then back to support our Cadets (congratulations on placing 2nd) and our Juniors, who had an outstanding finals run and were once again crowned British Junior Class Champions. Our A guard also had a fantastic finals run and placed 2nd as well as winning the FAN FAVOURITE award, a new award for 2019! So the World guard were back in movement and equipment warm-ups. An emotional time for all (but especially our US members, as it was their final UK performance), which the members channelled into their finals performance - having an outstanding run and being rewarded with a standing ovation and a score of 88.6. After a great party on retreat, it was time to take the silks off the poles, dismantle the props one more time and get ready for the airport on Monday. But not before some serious partying into the early hours of Sunday!!! Everyone is now packing ready for departure to Dayton (via Chicago) tomorrow morning!